Percival Duffin’s Salt tin box. Salt tin box. 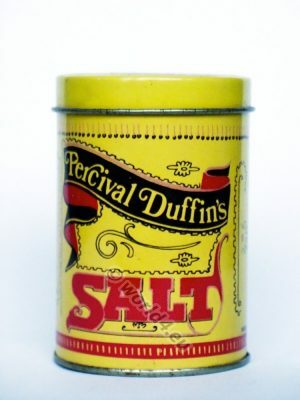 Manufacturers, Percival Duffin’s Salt. Vintage enameled sheet metal in the colors yellow, black and red. 1960s England graphics design and typography. Decorative Kitchen Collectibles. Previous PostAntique tin box from Austria. Hemostatic Stryphnon cotton. Next PostCigarette box by Grathwohl Kartal, Munich. German Art Deco Design, Color and Furniture, 1930s. Art Nouveau Ornaments. Decorative arts by Alfons Mucha. Vintage Can Opener Design of various Brands. Art Nouveau Ornaments - Belle Époque decoration 1910. Flower Tendrils. Alfons Mucha - Art deco Period 1910. Bravilor Bonomat mondo 2, Super electronic. Art Nouveau Ornaments. Illustration by Alfons Mucha 1910. Art Nouveau Ornaments by Alfons Mucha.